TGIF everyone! 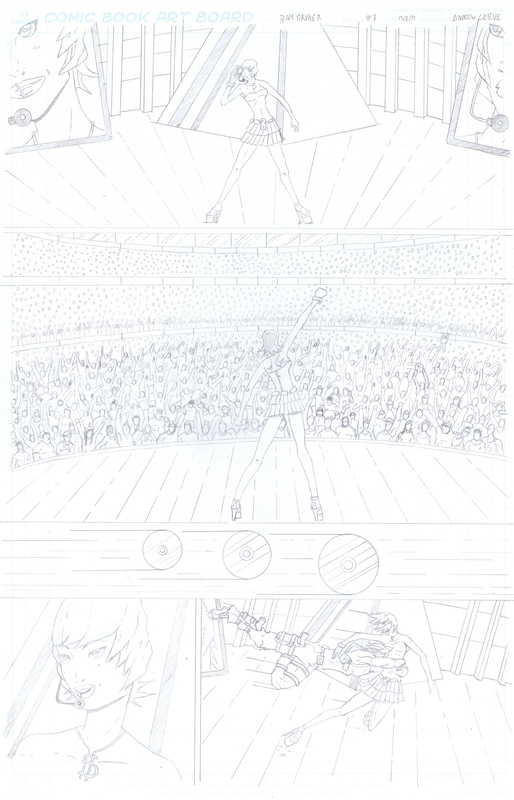 It’s very easy to guess what was the most challenging part of drawing this page just from looking at it. Drawing a sea of hipsters was a unique experience as I’ve never had to draw so many people in one panel before. Normally I’m usually dealing with Team Stryker, a villain and maybe a couple henchmen (or dinosaurs). Tackling a crowd of this size was just another notch on my growing art portfolio. Keeping all the people in perspective and in scale with one another was a matter of constantly checking the left side of the page to the right to make sure I hadn’t gotten off track. My favorite part of doing these crowds was sneaking my girlfriend in every panel that has a crowd in it. You can find her by looking for the girl with the crazy sweatshirt. In every panel of the crowd she is sporting a different one to reflect her adorable sweatshirt collection. Have a great weekend everyone and I will see you back here on Monday (my birthday!) for page 08 of Mission 004!